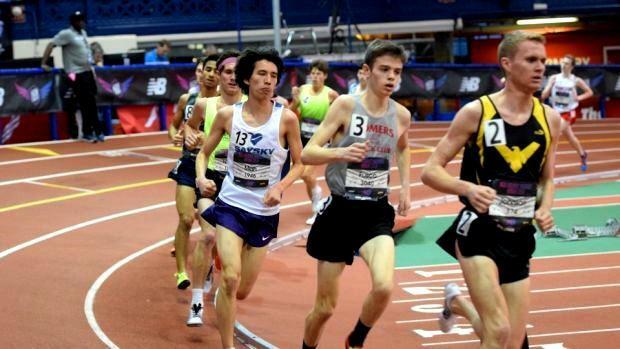 The season-ending New Balance Nationals Indoor (NBNI) Championships always seems to bring out the best in our athletes. It was no different this past weekend. Massachusetts saw five of its athletes earn top-six performances, or All-American, inside the historic New Balance Armory. Additionally, there were several other noteworthy performances on track and field's biggest stage. It all started on Friday, Day 1 of the three-day meet. In the Championship 5,000-meter run, Newton North's Andrew Mah was our first athlete to earn All-American status by finishing fifth overall with a time of 14 minutes, 50.0 seconds. Also on Friday night, Arlington dominated its heat of the Championship DMR and took eighth overall with a state best of 10:15.23. Two days after anchoring his DMR team with a 4:06 mile leg, Arlington's Ryan Oosting finished second overall in the Championship Two Mile where he crossed the line in 9:01.87. The boys from Lincoln-Sudbury clocked their fastest time of the year of 7:50.10 to place sixth overall in the 4x800m relay. Belmont's Annoush Karfian scored 3,392 points to secure fifth overall in the Championship Pentathlon. Samantha Friborg ran an all-time best of 2:08.76 to finish fifth overall in the Championship 800m. There was also Newton South's Lucy Jenks, who just missed All American by placing seventh overall in the Championship Mile with a big-time PR of 4:51.29, a best by more than seven seconds! Finally, Brockton's Jaylynn Cundiff leaped a distance of 23-3.5, a PR by nearly eight inches and an effort that earned him second in the Emerging Elite Long Jump. Now we want your vote. Of the eight performances we listed above, vote for the one you feel belongs at the top. Voting ends Friday at midnight.